The National Association of Enrolled Agents (NAEA)is the professional society that represents Enrolled Agents. Enrolled Agents are tax practitioners licensed by the U.S. Department of the Treasury to represent taxpayers before all administrative levels of the Internal Revenue Service on issues including collection, audits and appeals. To protect the interests of its Members and to enhance the role of the Enrolled Agent among government agencies, other professions and the public at large, with an emphasis at the state and local levels. National Association of Tax Professionals (NATP) is a nonprofit professional association founded in 1979 to serve professionals working in all areas of tax practice through professional education, tax research, and products. The national headquarters, located in Appleton, WI, employs over 40 staff members. Members of the NATP work at offices that assist over 11 million taxpayers with tax preparation and planning. 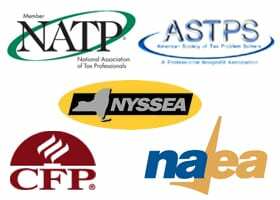 The average NATP member has been in the tax business for over 20 years and holds a tax/financial designation and/or a college degree. NATP has more than 20,000 members nationwide. Members include individual tax preparers, enrolled agents, certified public accountants, accountants, attorneys, and financial planners.